leading up to the Bank of America United Way campaign that begins (Aug. 26). From the time she first became a Bank of America associate in 1987, Gloria Ramos has staunchly supported United Way campaigns. But Ramos, an executive assistant in Middle Market Treasury Management, San Francisco, has a perspective on giving to the United Way that is different from most. She sees the annual pledge as a way to direct her contributions to a specialized program not affiliated with United Way. "I've always given to United Way," said Ramos. "But now, I have a special cause to support." Ramos participates in the United Way campaign at Bank of America as a way to channel her annual contribution to the Cystinosis Foundation, based in Oakland. 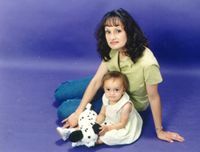 Her 4-year old daughter, Ariana Natali, was diagnosed with cystinosis when she was 18 months old. Since then, Ramos said, she's learned how important it is to have specialized agencies ready and able to provide care and support. Ramos explained that nephropatic cystinosis is a rare, incurable genetic condition that, in one form, strikes infants. The condition prevents the child's body from metabolizing a naturally occurring amino acid called cystine. In young children, this enzyme builds up in their systems and creates severe medical problems, especially affecting the kidneys and producing debilitating, life-threatening symptoms. Existing medical treatments can ease the symptoms, but early diagnosis is critical to prolonging life, and victims will likely require a kidney transplant prior to reaching adulthood. "Cystinosis is rare and is not widely known about or understood," Ramos said. "Ariana was nine months old when she first started having problems, but her condition wasn't accurately diagnosed for another nine months. Once we knew what we were dealing with, we were guided to the Cystinosis Foundation for assistance," she said. "The foundation helps families with all kinds of needs - the costs of special medicines, education and support groups." Perhaps equally important, explained Ramos, the Cystinosis Foundation helps the families of victims get involved in programs designed to educate doctors and the medical community. Ramos has become an active volunteer, providing English-to-Spanish translation, which is especially valuable for the Mexican Cystinosis Foundation, which carries out programs in Latin American countries. "Because Cystinosis is so rare, diagnosis of the disease is often overlooked. As a volunteer with the Cystinosis Foundation, I can work with other families of young victims to help communicate information about cystinosis research," Ramos said. Ramos' daughter receives treatment for her disease at the Lucille Packard Children's Hospital at Stanford University every four months, and additional care at Kaiser Hospital in San Francisco. "Today, thanks to the Cystinosis Foundation and the care she receives at Stanford and Kaiser Hospital, Ariana is a petite, adorable little girl, full of energy and enjoying life," Ramos said. "I will always participate in our United Way campaign, but I have a special interest in seeing my contributions go to an area that is of great importance to me." Associates who wish to direct United Way contributions to a specific agency may do so by indicating a preference on their contribution card during the campaign.